It's that time of year again everyone - the time where we are picking apples and enjoying many yummy fall fruits and vegetables from the autumn harvest. With so many delicious apples out there and fairly cheap, who wouldn't want to be baking or decorating their house with a variety of fun apple themed crafts made with their kids? 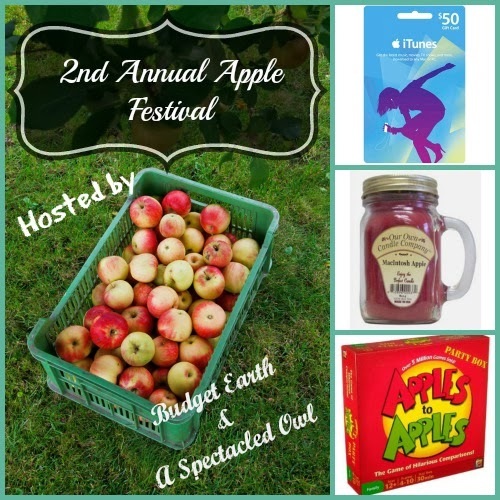 To celebrate apple season, Budget Earth is once again having their annual apple festival! 1 lucky reader will win a $50 iTunes Gift Card. 1 lucky reader will win a Apples to Apples game & an apple scented candle. Open to US Only. Winners will be chosen at random through Rafflecopter via Random.org. Giveaway ends November 30th at 11:59pm. Winner will be notified through email. Winner will have 48 hours to respond before a new winner is chosen. Budget Earth is responsible for prize fulfillment. Must be 18 years or older to enter Rafflecopter. Only one entrant per household. Entering the Rafflecopter means you agree to terms above. Good Luck! I like making apple crisp because it is easy to make and tastes delicious with a bit of whipped cream or ice cream. because my mother in law makes the best apple pie, the crust is amazing! Apple pie -simple, tasty & reminds me of happy memories.